High-safety and high-tolerance dermatological cleansing wipes for the sensitive and fragile skin of babies and children. • ABCDerm H2O dermatological wipes guarantee the gentle cleansing of the buttocks, folds of the skin, face, eyes and hands of babies and children. 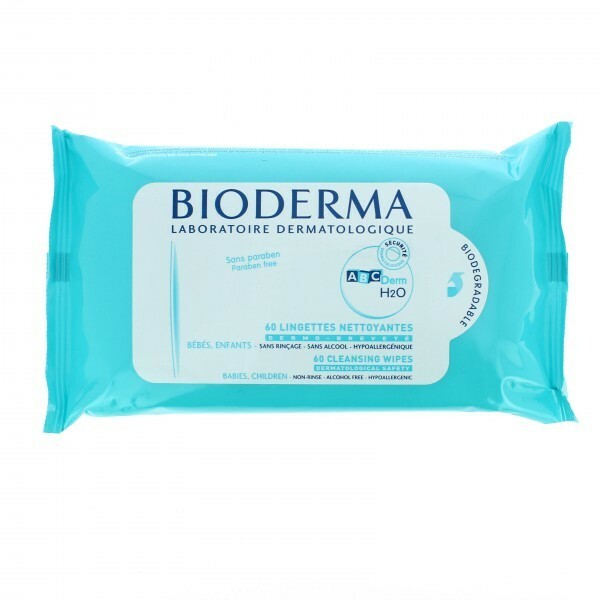 • Soaked in a micellar solution based on ultra-mild cleansing agents, ABCDerm H2O dermatological wipes respect the cutaneous balance of the most fragile skin types and provide an emollient effect without leaving a greasy film. • Large, thick and ultra-mild, they allow you to efficiently cleanse in one easy step and create a pleasant sensation of freshness. • ABCDerm H2O dermatological wipes guarantee perfect skin and eye tolerance. • Does not sting the eyes. - Gently clean your child's skin with a wipe. - Repeat until the wipe is clean (you can use both sides of the wipe). - Gently pat the skin dry. - Use as often as needed. - We recommend the subsequent use of an ABCDerm care product. Remember to close the bag tightly after using the wipes to preserve their moisture. BIGUANIDE, SODIUM HYDROXIDE, FRAGRANCE (PARFUM).